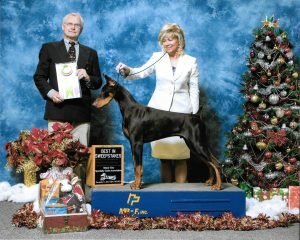 Luke at 7 months at his first show winning Best In Sweepstakes under Judge Gary Cooper. Patricia Murray, Luke’s handler using her amazing talent to show Luke to perfection. Luke is VWD Clear (complete health testing will be completed when Luke is 2 years of age).